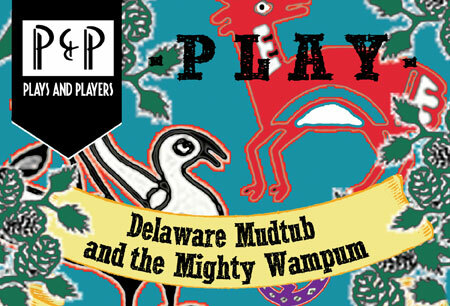 Plays & Players, one of the country’s oldest continually operated theaters, is offering Bindlestiff customers 20 percent off for the premier of their new children’s play, Delaware Mudtub and the Mighty Wampum. Written by local playwright Greg Romero, the play offers an immersive, interactive experience for young audiences (ages 4 and up), sharing living stories that capture the magic all around us. Delaware Mudtub and the Mighty Wampum runs March 13th to 29th. The play features animals native to our region and is based off of local Lenni-Lenape legends, with characters including Turtle, Fox, Great Blue Heron, Otter siblings Earle and Pearl, and the ever-lurking Wolf. Student matinees on Wednesdays through Fridays at 10 am, tickets $10. For weekend shows at 11 am and 2:30 pm, $15 per person or $12 for groups of ten or more. For tickets, go to http://www.playsandplayers.org/ or call 866-811-4111. Bindlestiff customers can receive 20% off (online or at the door) with the code BINDLESTIFF20. Plays & Players is at 1714 Delancey Place; the show (held in the 3rd floor Skinner Studio) is part of their Philadelphia Local Artists for Youth initiative. Are we open today? Hard to say. As we write, the snow has stopped. If that holds, we should be open more or less our normal hours. But call first (215.662.5780), as shoveling or other problems might interfere… Same for Friday, where the issue is more whether sidewalks are passable for the opening shift. Even if it snows again tonight, we would hope to be open by mid-afternoon. We will definitely be open normal hours Saturday and Sunday. The current New Yorker magazine features an article by George Packer, “Is Amazon bad for books?,” which discusses how the online bookseller bullies publishers into granting it special payments and larger discounts. (Independent publishers are forced to pay more than the Big Six publishers.) The government has helped Amazon by suing publishers who tried to break Amazon’s iron grip on ebooks, exempting it from sales taxes (even now that it has started collecting state sales tax, it still does not collect or pay Philadelphia’s sales tax), and ignoring its predatory pricing and other anticompetitive practices. The owner of Cody’s Books (now defunct) once described Amazon as a giant warehouse backed up to the stock market. At the time, Amazon was losing hundreds of millions of dollars a year, even as its stock price climbed ever higher. Those losses went to deep discounting, which built market share, which the company used to force publishers into granting it ever-more-favorable terms, which finally allowed the company to become profitable (most of the time — but just barely; Amazon only recently earned back the huge losses of its opening years, and still loses money about as many quarters as its profitable). But this is not charity. The company is building market dominance. As it builds its power, it uses its clout to extract ever-better terms from its suppliers (especially the most vulnerable) and raises prices to consumers. When/if it succeeds in eliminating the remaining competitors, its monopoly power will be unconstrained. That’s why the stock market keeps pouring money into a firm with steadily rising total sales, but also shrinking profit margins. They’re looking to cash in once Amazon has the field to itself.